At Swan Plumbing, Heating & Air, we get a lot of customers who were referred by their friends or neighbors. Our customers know that when they call us they have the peace of mind of knowing that they will get the services of an experienced, licensed HVAC professional. All of our technicians are North American Technician Excellence and EPA certified. Our customers also know that we offer some of the lowest prices for Amana AC service and installation in the Denver area. Our commitment to customer service and our 100% satisfaction guarantee have earned us an A+ rating with the Better Business Bureau. If experience and exceptional service are important to you, Swan is the clear choice for Amana air conditioning repair and replacement. Or, click here to schedule your Amana air conditioning service online. 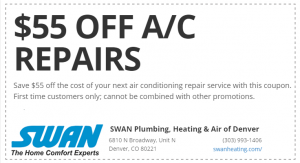 When you call Swan for your AC repair, you will never be hit with unexpected fees or charges. Our technician will give you a written estimate between starting work on your AC unit. Our commitment to upfront pricing is just one way in which we earn your trust. If your AC system is old, a repair may not make financial sense. If this is the case, we will give you a written estimate for installing a new Amana replacement system. Amana air conditioners consistently receive top ratings for dependability and efficiency and come with warranties that are among the best in the industry. Amana manufactures air conditioners with a variety of efficiency ratings ranging from 13 SEER to 18 SEER. The SEER, or the Seasonal Energy Efficiency Rating, of your air conditioner is similar to the mileage rating of your vehicle. A higher SEER number means increased efficiency and lower operating costs. To receive an Energy Star rating, an air conditioner must have a SEER of 14 or higher. To make it easier to find the right AC system for your home, Amana offers three tiers of air conditioners. These tiers are labeled as “good,” “better,” and “best.” The following is an overview of the performance and features that you can expect with each type of system. Good: These units provide single-stage cooling and come with the lowest price tag. They offer average efficiency and are meant for spaces that do not need cooling on a daily basis. Better: These units have options for single-stage or two-stage cooling for Energy Star level efficiency. They provide greater cooling power than units rated as “good” at a moderate price. These units are the most popular among Denver homeowners. Best: Although these units are the most expensive, they also offer the greatest efficiency and cooling performance. These top-of-the-line air conditioners feature two-stage or variable-capacity cooling. When choosing an air conditioning system, it is important not to get a unit that is too big or too small for your home. This simply results in decreased comfort and higher utility bills. While some HVAC companies may steer customers toward the largest or most efficient unit available, we will never try to sell you more air conditioner than you actually need. Purchasing a complete Amana HVAC system will give you the most efficiency since all of the components are designed to function together. Even if you only decide to replace the air conditioner component, we will help you find the unit that will integrate with the rest of your home comfort system. Unexpected air conditioner repairs can put a huge financial strain on your family. To ease the burden, we are proud to offer our Swan Club Membership to homeowners in Denver and the surrounding areas. Membership provides you with substantial discounts on emergency repairs as well as routine maintenance and new installations. For more information about Swan Club benefits, be sure to visit our Swan Club Membership page. Swan serves homeowners in Denver, Littleton, Boulder, and the surrounding areas. If you are looking for a skilled HVAC professional to handle your air conditioning repair or installation, contact us today.